CHICAGO (WLS) -- Chicago reached a record low temperature of 0 degrees Friday morning. But things are looking up. Friday will be the coldest day in the next seven day, as temperatures warm to the 50s by next week. The record low temperature for March 6 was 2 degrees, set in 1960. 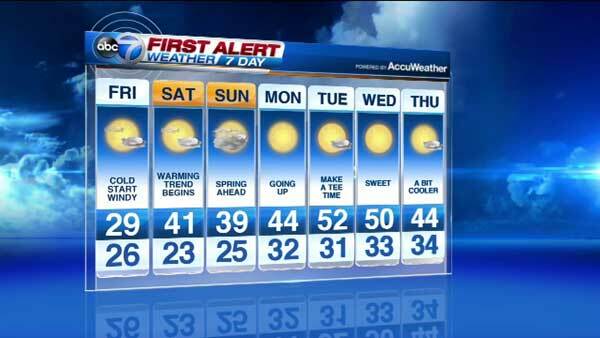 The mercury dropped to 0 degrees at O'Hare Airport around 4:30 a.m. Friday. Chicago experienced frigid temperatures in the single digits Friday morning with wind chills well below zero. But Friday's high temperature is expected to be near 30 with partial sunshine and increasing winds. ABC7 Meteorologist Tracy Butler said a warming trend is expected to begin over the weekend. Highs will hover around 40 on Saturday, which is normal for this time of year, and reach the 50s by Tuesday. The only precipitation in Butler's seven-day forecast occurs on Sunday. She expects a few flurries early in the day. But other than that, it's sunny skies for the next week.